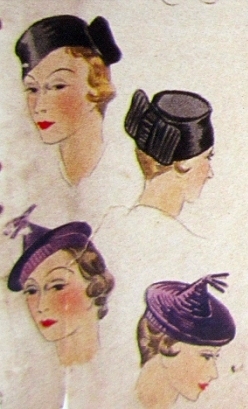 Two dresses for May, 1938. Butterick Fashion News flyer. Butterick 7847 and 7839. 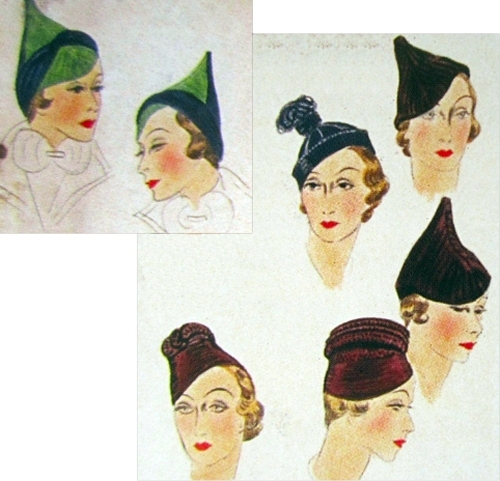 Pattern descriptions and back views for Butterick 7847 and 7839, May 1938. 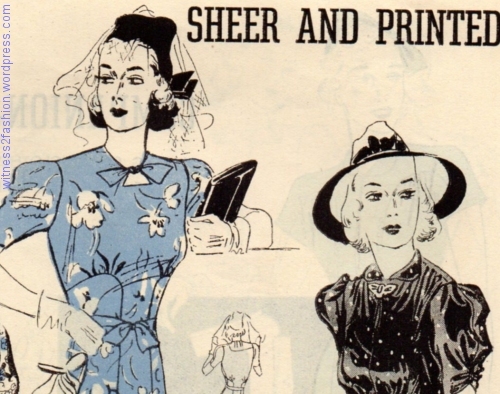 These (mostly floral) print dresses appeared in the Butterick Fashion News flyer in April and May of 1938. Print dresses for Spring, 1938. 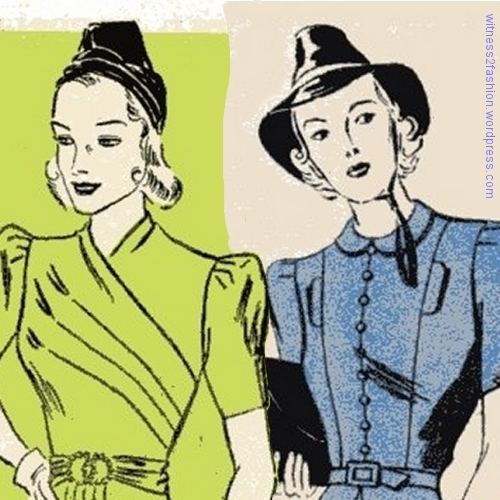 Butterick store flyer, April 1938. Butterick 7813, left, and 7801, right. Butterick dress pattern 7809 illustrated in a large-scale print fabric. 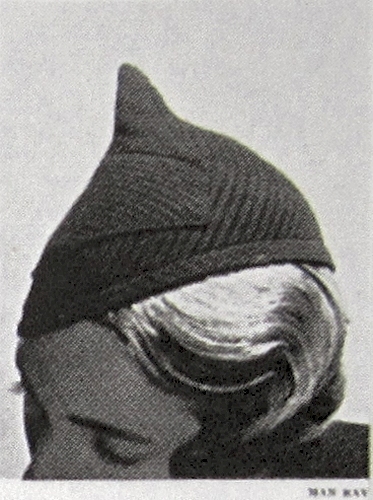 Butterick store flyer, April 1938. Available up to bust size 44 inches. 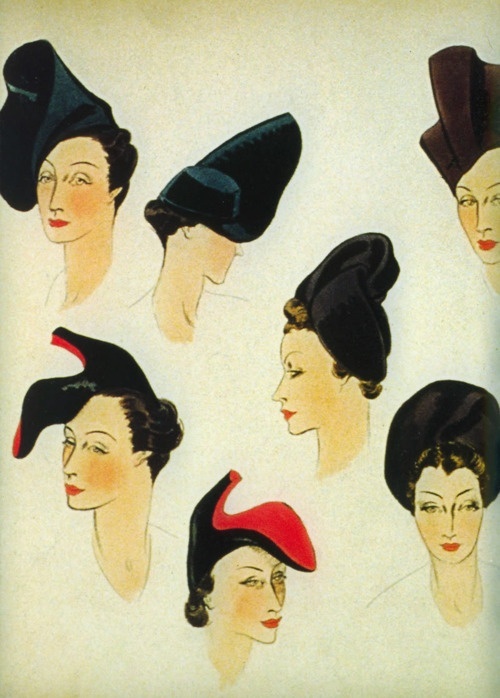 Butterick patterns 7786, 7784, 7817, and 7795. 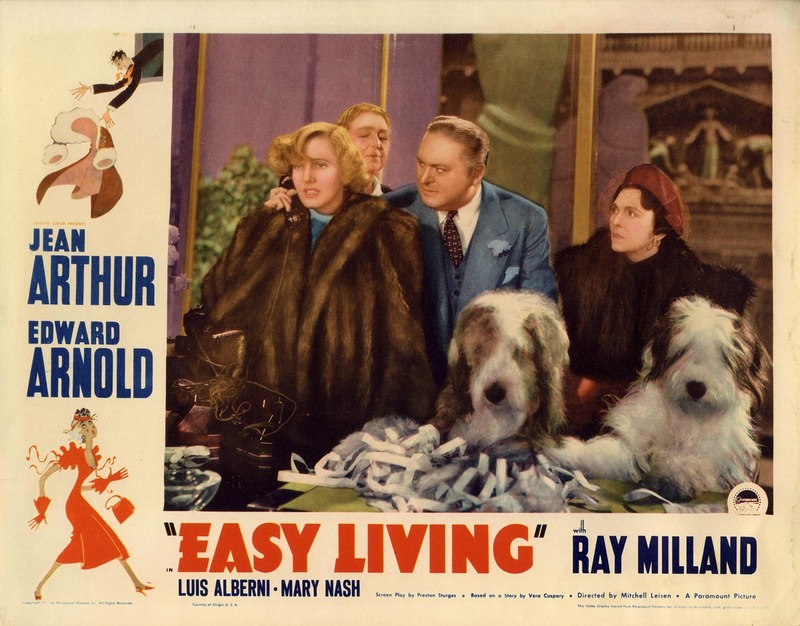 Store flyer for April 1938. 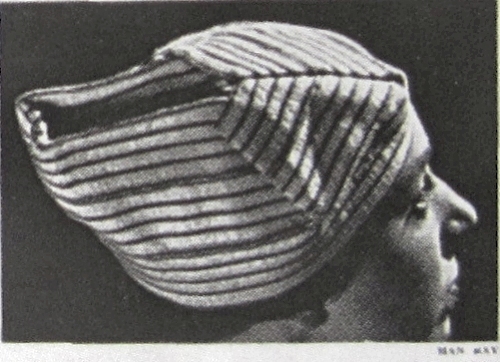 Patterns for older and larger women were also illustrated in print fabrics. 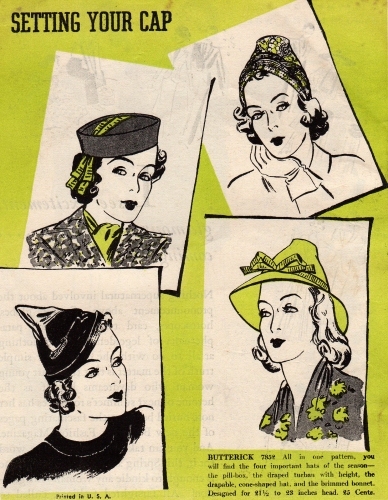 Butterick patterns 7802, 7799, and 7815; store flyer, April 1938. 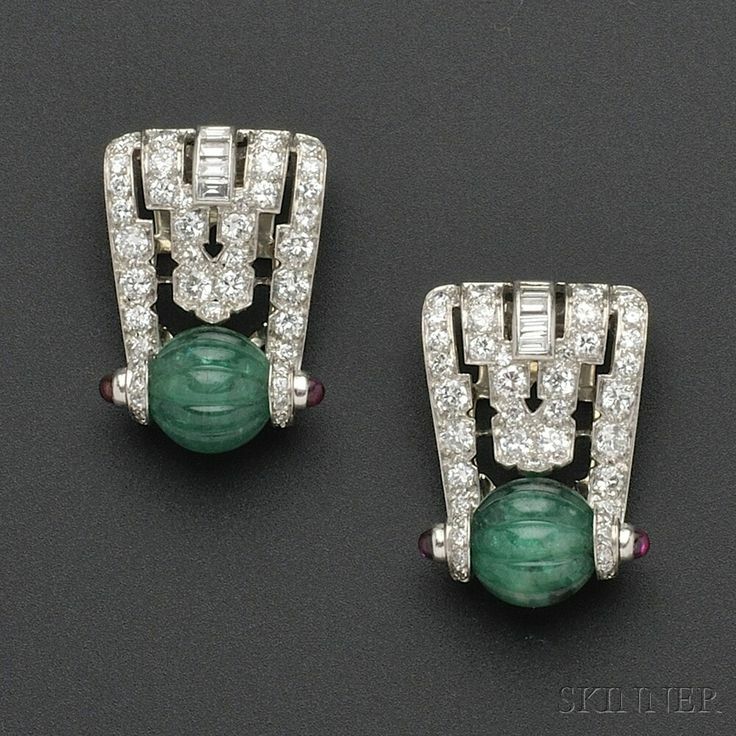 These were available up to size 50 or size 52. Smaller and younger women could also find patterns — and print fabrics — to meet their needs. Butterick 7862 was for women 5′ 4″ and under. Store flyer, May 1938. The “jacket frock” in the center is for Junior Miss figures up to bust size 38. 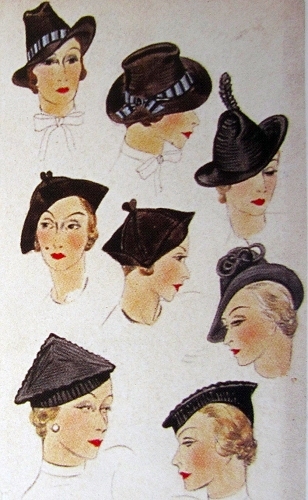 Companion-Butterick patterns 7830, 7836, and 7828, from May 1938. The one on the right has print lapels and sash. 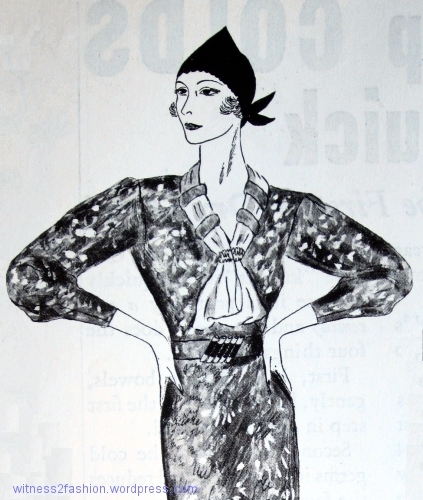 The dress on the cover for May 1938 was polka-dotted. Butterick 7857. Left, a big floral print on Companion-Butterick 7829. Next, No. 7823 has a floral print sash. 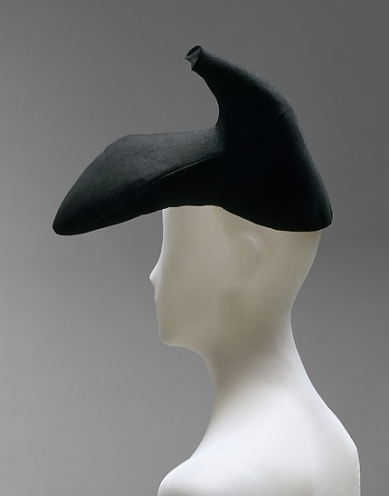 Its neckline is attributed to Vionnet’s influence. The dress with bows, No. 7827, is shown in a smaller, widely spaced white floral print. Right, No. 7825. All were available in a wide range of sizes, to fit either young and small women (Sizes 12 to 20) or women up to bust 44″. 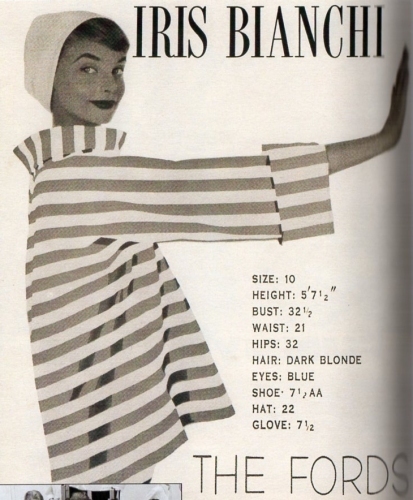 Butterick store flyer, May 1938. Bold border print fabrics were suggested for these “Beginners'” sewing patterns. These patterns for inexperienced dressmakers use 52″ border prints. One has a zipper front, and neither has set-in sleeves. Butterick 7838 and 7864. May 1938. 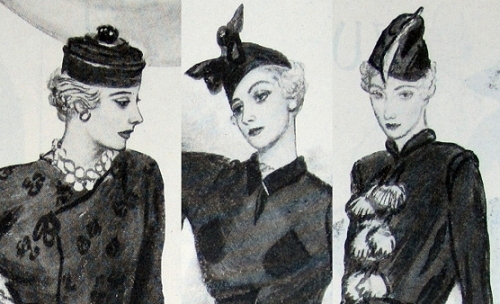 Butterick dresses for Spring, 1939. Patterns 8366, 8387, and 8372. 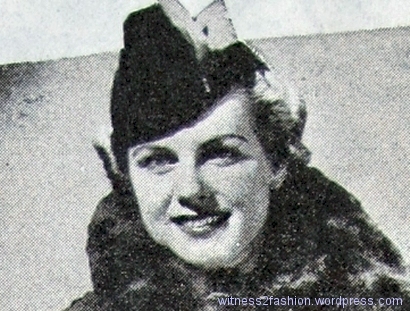 Butterick Fashion News flyer, May 1939. 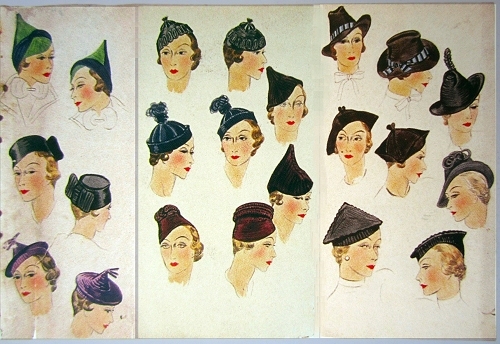 Butterick dress patterns from May 1938 (left) and May 1939 (right.) Butterick store flyers. 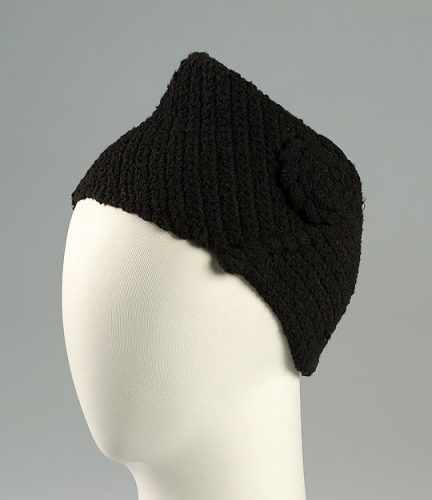 For May, 1939, a suit jacket and bodice are piped with the same polka-dotted fabric that makes the “pancake” hat, worn very far forward on the head. 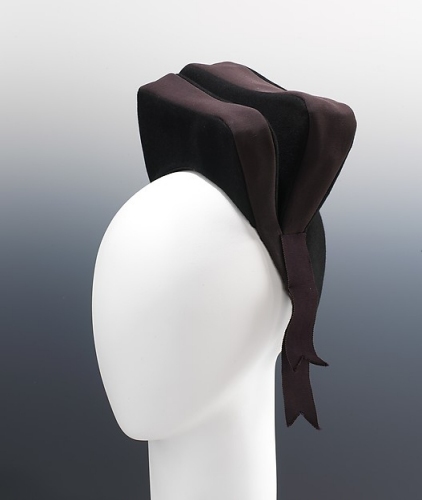 The hat is Butterick pattern 8359. The suit, with knee length skirt, is Butterick 8351. The long skirts introduced in 1947 were looking too long by January of 1951. Compare this cranberry red coat dress, from November 1949 . . .
Coat-dress, Butterick pattern 5070, cover of Butterick Fashion News, November 1949.
. . . with this fitted black coat from December, 1951. Butterick coat pattern 5906, BFN flyer December, 1951. The “One Yard Skirt,” Butterick 5087 from 1949 (below, left) was on the back cover of the November Butterick Fashion News flyer, and other skirts featured in that issue were as long, or longer. 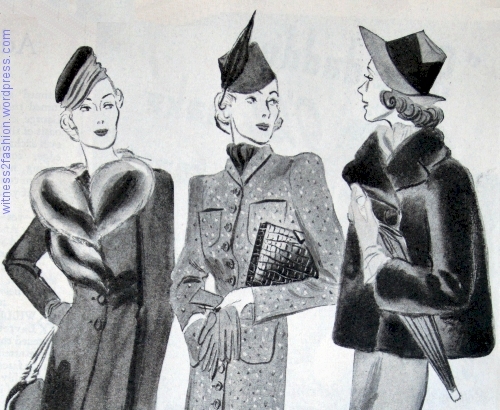 Skirts from Butterick, November 1949. Left, the One Yard Skirt (5085), with skirt 5084 and suit 5083. Notice the man-tailored front fly on No. 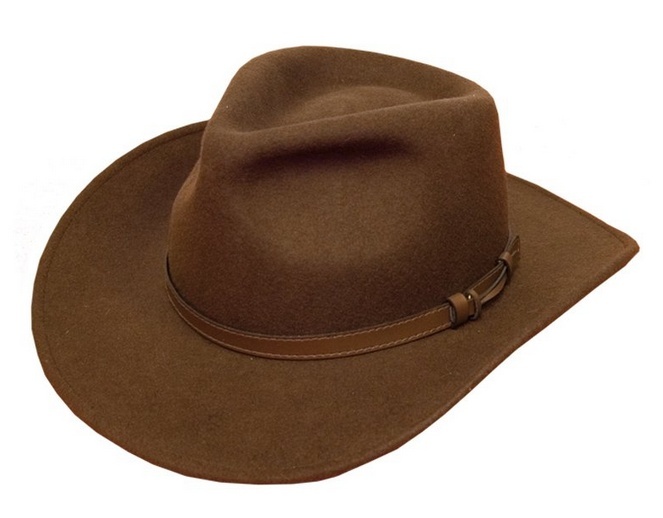 5085. Below mid-calf skirts from Butterick Fashion News, November 1949. 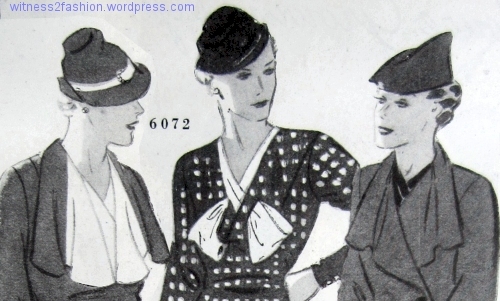 Butterick skirt patterns 4701 (first issued several months earlier), 5069, and 5078. Butterick dresses with “hemline interest,” page 4, January 1951. The hemline has risen. 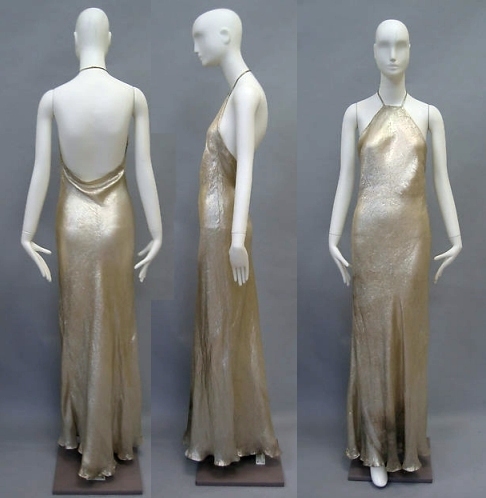 More dresses with hemline interest and neckline interest, page 5. 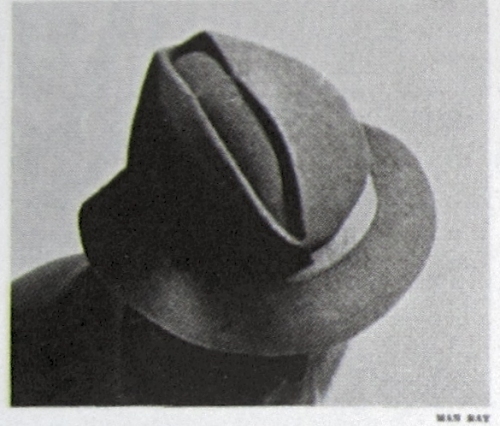 BFN Jan. 1951. These dresses were for women, not teens. There has certainly been a subtle change in proportions. Dresses from Butterick, January 1951. Patterns 5559 (versions A, in red, and C, in black) and pattern 5564 (in gray). Butterick Fashion News flyer. Suit 5083 has a “lumberjack top;” its waist-length jacket, tight around the waist, was often called an “Eisenhower” jacket in the fifties. This two-piece outfit from Butterick, No. 5083, has a “lumberjack top.” Nov. 1949 flyer. “Bell-skirted” dresses for the holidays, December 1951. Butterick Fashion News, page 13. Left, No. 5941; right, two views of Butterick dress and redingote, No. 5942. Butterick coat pattern 5906, for a “bell-skirted, fitted coat… intended for your crinoline-petticoated dresses.” BFN flyer December, 1951. Often, a nylon crinoline would be built into a store-bought dress. 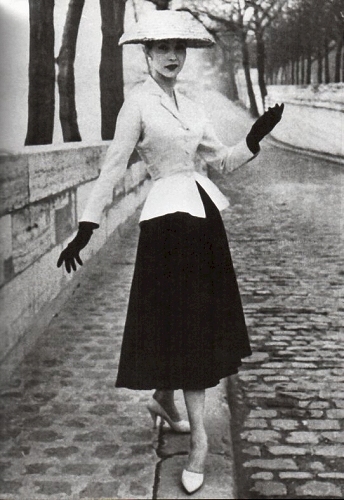 Pattern companies depend on following trends, so shorter skirts must have been “in the air” before December of 1951. What-I-Found posted images from a Simplicity flyer, dated August 1950, here. Butterick 4609, evening gown from Butterick Fashion News, August 1948. 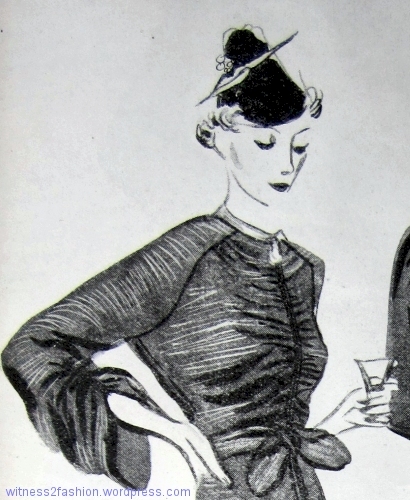 I’ve been looking at pattern illustrations from 1948, when Dior’s “new look” was getting women into waist-cinching undergarments, full (sometimes padded) hips, and a long, long silhouette. Butterick 4610, from Butterick Fashion News, Aug. 1948. The waist is exceptionally narrow compared to the hips. Simplicity store flyer, patterns from April 1948. Note the waist sizes. Butterick suit pattern 4600 from August 1948, Butterick store flyer. Butterick suit pattern 4569 was available in a special version for women under 5′ 5″ tall. Store flyer, July 1948. If suit 4569 seems awfully tall and thin for a petite woman — it is. Ad for Butterick, back of Butterick Fashion News, July 1948. 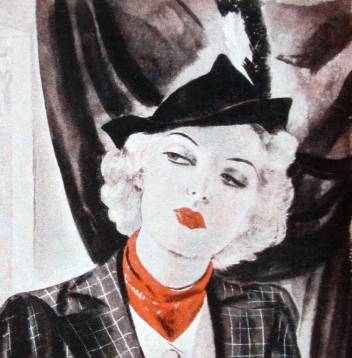 Photo and fashion illustration from July 1948. 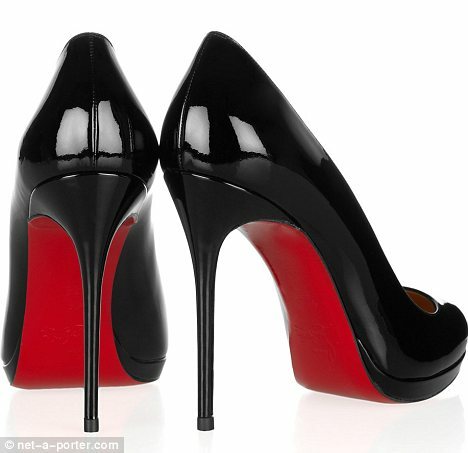 Using her head as a unit of measurement, the real woman is six and a half heads from crown to heel. 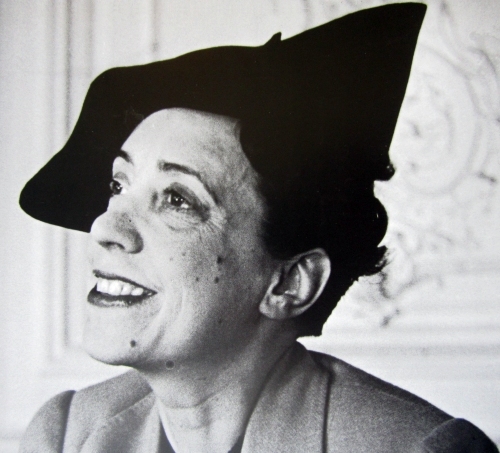 The illustration is eight heads high — a woman stretched by more than a foot. And compare their waists! Over the decades, we appear to have selectively chosen fashion models to match fashion illustrations, putting very thin, 5′ 11″ tall women into very high heels, to resemble these old drawings of imaginary human beings.